DESCRIPTION FROM THE PUBLISHER: People, children especially, have been baffled, bewildered, and even outraged by the fact that Pluto is no longer called a planet. 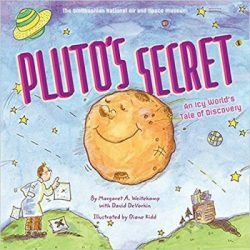 Through whimsical artwork and an entertaining dialogue format, Pluto’s Secret explains the true story of this distant world. Providing a history of the small, icy world from its discovery and naming to its recent reclassification, this book presents a fascinating look at how scientists organise and classify our solar system as they gain new insights into how it works and what types of things exist within it. The book includes a glossary and bibliography.